Bruce and I met in 1999 sailing aboard the boat of a mutual friend. We were friends and racing buddies until we began to date in 2000. Our first kiss was on New Year's Eve 2000 on the Lady Jane, a C&C 41, owned by (now) fellow Cruisers. We dated, moved in together and finally married after four and a half years... July 18, 2004 in Newport, RI. We had a simple and beautiful wedding on the water in a near white-out fog with the Tall Ships Parading under the Newport Bridge as a backdrop. There was no real plan to cruise when we married... just a "someday" kind of dream. Who knew it would become a reality? Bruce taught Jr. High and High School for 30 years in Wichita, KS and coached a USS Swim Team for 14 years, producing a number of nationally ranked Age Group Swimmers. He also coached High School Swimming and in his final year, his Boy's Team finished third at State and his Girl's Team finished second. He retired in 1998. His plan was to spend winters in Corpus Christi, TX and summers in the Rocky Mountains. Instead... he met Tammy. He became a full time resident of Corpus Christi where he took a position as the Head Swim Coach for Corpus Christi Carroll High School. His Girl's Team won five district titles and four regional titles, his Boy's Team won five district titles and five regional titles during the five years he coached. Bruce has been sailing since 1971, starting with a sunfish and progressing through a Clipper 21, a San Juan 23, a Tartan 30, a CS 33, and a CS 36. The CS 36 was sold in February 2012 to make way for our Cruising Home, Dos Libras. He raced all of these with the exception of the last. Racing days are now over and Cruising has taken it's place. Bruce has always dreamed of going Cruising. 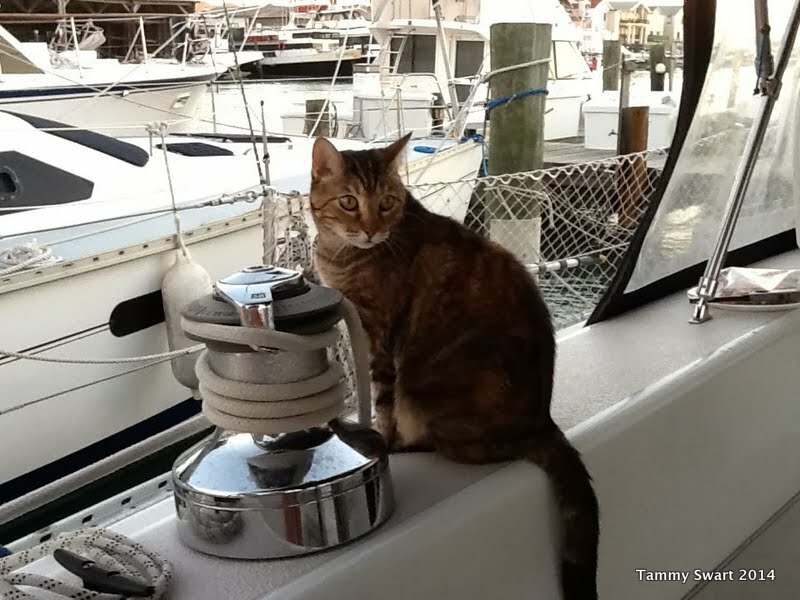 Tammy: I found sailing in 1997, right before my divorce. I was married to the father of my two daughters for 18 years. I grew up watching the sailboats on Corpus Christi Bay without ever thinking that some day I could go sailing on one. The opportunity to go sailing presented itself and I took it... starting me down the path that changed my life. I married young and my life was filled with raising my children. My family moved from Corpus Christi, to East Texas, to Alice, Texas and then back to Corpus Christi. I never really had much of a hobby to call my own. Being a mom, wife and employee was pretty much "my life"until my divorce. Luck of fate provided me the opportunity to discover my love of sailing, beginning with a raucous racing phase, during which I met Bruce. We raced together for several years while our friendship became more, culminating in his proposal of marriage. I had the ring on his finger 10 days later, ending his bachelor days. We gave up racing in favor of the Cruising lifestyle. I don't miss racing but I know that Bruce still longs for those golden days. We finished raising my youngest daughter together and watched both daughters grow into the amazing young women they are today. We progressed through recent years full of my job, home ownership and Yacht Club memberships with the Cruising dream in the background. I was manager of a medical practice for over 16 years. Management has made me very strong willed and decisive. I know that Bruce struggles with my strength of will daily and it's a miracle that he hasn't strangled me in my sleep... But my personal strength and confidence has allowed me to become not just a First Mate, but a Co-Captain to Bruce. We have a wonderful boat relationship where he provides gentle guidance allowing me to take ownership of all of the processes, from navigation to mechanical maintenance. I love to problem solve and this boat provides a plethora of opportunities that will keep my mind occupied now that I have quit working in "the real world". I have taken over the duty of helmsman when getting under way, anchoring and docking. Bruce handles the duties that require physical strength like handling the docklines and anchoring. It just makes sense to us and it serves us well. I also usually take the helm when we sail downwind in following seas. I quit my job (June 2013) and we spent the summer finishing up boat projects. After living aboard for almost a year in preparation for Cruising, we tossed off the docklines for good on September 30, 2013. Our dream is underway. After spending the month of January 2014 in Clearwater, FL we will head South with hopes of making it to the Bahamas by April or so. As "plans" go in the Cruising world... all of this is written in muck and subject to change with the weather. Jetsam Bruce and I got Jetsam from the Humane Society in 2000 when she was about 3 months old. Her personality was already set and we should have been tipped off as to what that would be when the lady referred to her as "That little psycho cat". We have spent years trying to understand her. We knew that she would be our challenge when we moved aboard. She is very nocturnal and comes alive when the sun goes down. This is problematic since she's black... she slips by us unseen and has escaped a couple of times. The majority of her time living on land was spent hiding in our walk-in closet. She is very stealthy and wants to slip out the front door any chance she gets. We were happy to see that once she adjusted to boat life, she seems to love being able to be outdoors. It's been a slow process with her but we think she likes it! Jezabelle Our daughter brought Jezzer home in 2001. She was one of a stray litter dragged from underneath a house. She seems to be perfectly pleased with her found fortune. The daughter left but Jezabelle was returned to us soon. She is a stinker and a joy and wants nothing other than to be with us. She has adjusted very well to boat life. She is an alpha cat and is sometimes a little mean to Jetsam but I can't stay mad at her when she crawls into my lap and purrs loudly. She is a trooper when we take the boat out. She does get a little seasick but is very stoic about it. Just hurls and carries on... Hopefully that will eventually pass.